ALL RELATIVE: My wife, Ellen, and I live in a unique and wonderful example of early 20th-century architectural place-making and garden design in Raleigh. It was the work of this Renaissance woman that I happen to be related to, my great-aunt Isabelle Bowen Henderson. She studied at the prestigious Pennsylvania Academy of the Fine Arts and was an artist in the Arts and Crafts tradition. She had to overcome a lot of adversity in her life. When she was in her 30s, her son died in infancy, and then her husband, Edgar, had a nervous breakdown and was institutionalized. In 1937, her father bought the small house to help the couple get their lives back together. They moved to Raleigh then, but separated soon after. 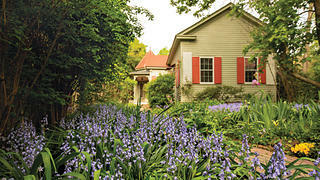 Isabelle started transforming the Late Victorian house and the 1.2-acre grounds into a world of its own. HANDS ON: In the 1930s, John D. Rockefeller Jr. was in the middle of a major restoration of Colonial Williamsburg, bringing the Colonial capital of Virginia back to its heyday. The rest of the country got caught up in reviving the past. Isabelle was inspired to create her own version of a Colonial residential enclave. 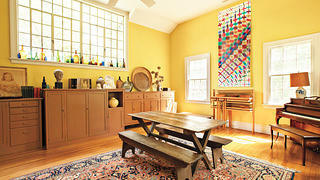 She added three outbuildings to create a quadrangle. There’s an herb house, where she displayed her pottery collection. The two-car garage is designed with elliptical head doors and big wrought-iron strap hinges to look like a carriage house. Russ Stephenson and Ellen Longino stroll past the carriage house. 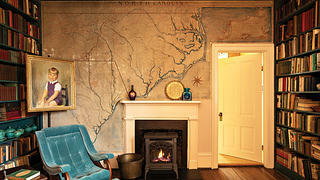 In the front room of the main house, she painted a whole wall with a 1770 map of the Carolina Colonies. It’s a statement that says we have our own Colonial tradition here; it’s not only in Virginia. 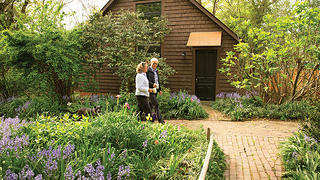 She was also on the leading edge of garden design and planted an Arts and Crafts mixed-perennial garden. The common threads are the ideas of honesty, simplicity, and handicraft. GARDEN ROOMS: Isabelle was an artist who created this 3-D composition of buildings and gardens. They have a calculated informality. She used the cluster of structures to create outdoor rooms, with fences that enclose and divide spaces, and gates that open into new vistas. The property is about exploration and discovery; it’s not very big but feels like it goes on and on. And there are some great details, like the dovecote on the top of the carriage house. It’s a little copper pyramid with a weathervane shaped like a squirrel. She had some fun there—she had the talent and the means to play with those building elements. 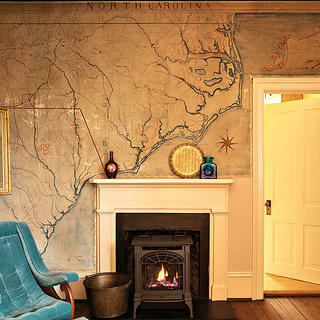 The front room’s highlight is the wall map Henderson painted of the Carolina Colonies. PORTRAIT OF THE ARTIST: As a skilled portrait artist, Isabelle’s stock in trade was cherubic children’s portraits. She used the proceeds from her commissions to build this enclave. As a child, I was totally amazed by this magic place that Isabelle had created. It was a fantasyland, with this little quadrangle and dappled light falling over the brick terrace, and fabulous gardens in the front and back. Isabelle would put me and my brother to work in the garden and buy us art supplies. She died in 1969, leaving the house to her sister Phyllis, my grandmother. CLOSE CALL: I moved to Raleigh in 1975 to study architecture at North Carolina State University, and my grandmother put me up in the guesthouse. She really didn’t have the means to maintain the property, and the state and city tried twice to condemn it because they wanted to widen the nearby road from two lanes to five lanes. I watched her fight all the “powers that be,” as she would say, in a legal battle that took five years. Even though she won, there was no guarantee that they wouldn’t come back again. So we wrote the nomination for the National Register [of Historic Places] in 1988. Being on the National Register doesn’t give you any protection other than in the court of public opinion, but that’s important. 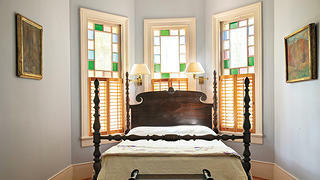 The guest bedroom’s stained-glass windows date to around 1900. Part of the charm of these buildings is that they’re intimate and close to the ground. That means that rain is constantly splashing on the bottom siding so it rots out, so we’ve had to replace or repair the floors for all the outbuildings. I’m an architect, and my wife and I are both general contractors, so this is what we do. Isabelle Bowen Henderson’s former studio. We live in the main house. I use the barn as an office for my architecture practice and my work as a councilmember for the city of Raleigh, and we rent out the carriage house and the guesthouse. Hopefully we’ve raised our son to appreciate what Isabelle did and what my grandmother did to preserve it, and our efforts to restore it. He’s working on the West Coast right now, but we hope he understands he’s next in line!